There’s been a lot of talk lately about how spider silk is this crazy wonder material that may soon find its way into everything from electronics to ultra-strong fabrics. Now, there’s another reason to be excited about spider silk: doctors might one day use the stuff to grow you a new heart. Growing new organs and tissues outside the body is the bleeding edge of biomedical research. Just imagine: if doctors could grow replacement hearts or kidneys from a patient’s own stem cells, that patient would no longer have to face the agonising prospect of waiting to find a suitable donor. The risk of organ rejection would become nil. But there’s a lot of R&D to be done before we get there. One initial challenge has been finding a scaffold material to grow organ tissues on—something that’s non-toxic, will not impede cell growth, and will not, itself, be rejected by the body. That, it turns out, is a pretty tall order. 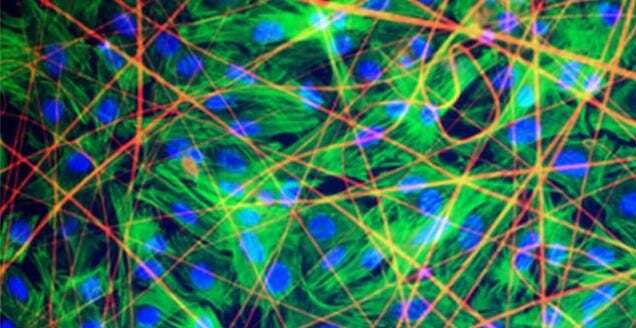 But, as described in a study published recently in PLOS ONE, genetically engineered fibers of spidroin—the protein that builds cobweb strands—might just fit the bill when it comes to human heart tissue. Spidroin fibers have already proven themselves a useful substrate for growing tendons and cartilages. Researchers at the Moscow Institute for Physics and Technology decided to see whether spidroin grown in the lab via genetically modified yeast cells can also be used to grow cardiomycetes, the cells that form heart tissue. It’ll probably be some years yet before we’re growing full human hearts on any sort of artificial scaffold, but it’s exciting to see that progress is being made toward that goal. If the idea of an artificial heart that’s stitched together with spider webs sounds a bit creepy, know this: those fibres are five times stronger than steel and twice as elastic as nylon. If anything, it sounds like an upgrade. Read the full open-access scientific paper at PLOS ONE.